We’ve made it to the end of Take Your Content To The Next Level Week and I can’t tell you how much fun I’ve had connecting with you this week. The #jennypurrchat on Wednesday night was such a wonderful experience and I’m definitely planning on hosting another one for the Jennypurr community super soon. This week we’ve focused on Building An Editorial Calendar From Scratch, 10 Steps To Bringing Some Life & Purpose Back Into Your Social Media Channels, How To Create Content For Your Ideal Readers, and Three Steps To Creating A Visual Style For Your Blog Posts. 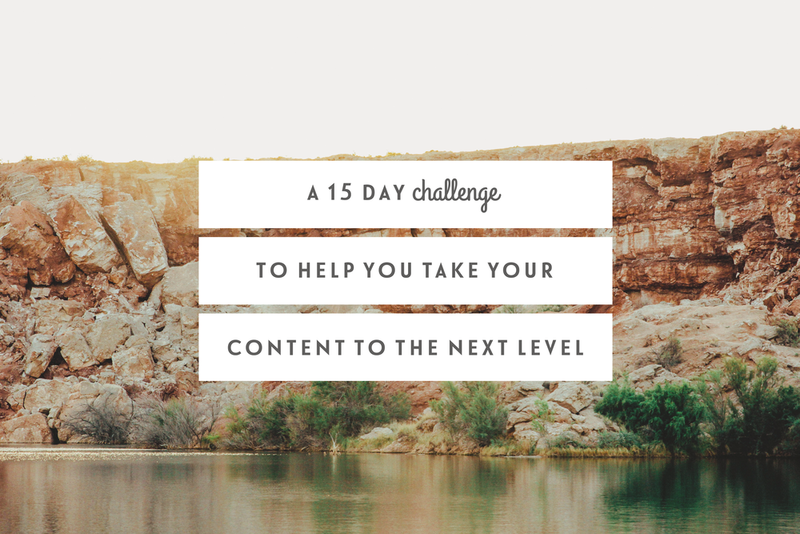 To end the week, I want to leave you with a 15 day challenge that will hopefully help you to really take your content to the next level. If you've enjoyed Take Your Content To The Next Level Week, make sure you sign up for my Weekly Letters for Bloggers & Creatives for exclusive content each and every Sunday. Day 1: Be brave + reach out to another blogger friend you know and ask them if they will be your #TakeYourContentToTheNextLevel mastermind buddy. Put a Skype session/coffee date in the diary for the following week - I’ll explain why in step #7. Day 2: Audit your current content. Be super honest about how you feel about your blog archives for the past 2-3 months. Which posts have you loved? Which posts could you have pushed further? Which ones have engaged your audience the most? Are there any areas you want to improve? Day 3: Figure out your big picture blogging goals & aims and write a manifesto. This will help you to stay super focused moving forward and plan exciting content that works towards your big picture goals. I talk more about these steps in-depth in this and this post. Day 4: Explore who your ideal reader is. This way you'll be super focused on who you're creating for and how you can connect with the right people for you. I broke this stage down in more depth in this recent post. Day 5: Focus your categories & columns and brainstorm any upcoming series + themes. I talk about this in more depth in my post on Building An Editorial Calendar From Scratch. Day 6: Have a content planning session and come up with 1-2 months worth of possible content ideas. Jot down all your ideas onto a piece of paper/word document and let yourself just explore all of the posts you're itching to create. Stuck for content ideas? I have five questions for you that might help here. Day 7: Have a Mastermind Session with your #TakeYourContentToTheNextLevel buddy. Share your ideas, ask for each other's opinions, and inspire and encourage each other to be brave and bold with your online spaces. Day 8: Set 2-3 goals for the next 2-3 months for your blog. Write them down in a notebook/word document. Brainstorm ways taking your content to the next level can help you get there. Ask yourself the question: if I could do one thing with my blog, what would it be? Day 9: Build the foundations of your digital calendar. I break down this step in-depth in this post. Day 10: Finalise your blog post ideas for the next two weeks - one month depending on how far you like to be in advance. Build these into your editorial calendar so you can see your content plan at a glance. My top tip for this step? Be strategic in how you spread out your content. Build it so that it flows nicely from piece to piece. Day 11: Develop your visual style for your blog posts. I break this down into three easy steps here. This stage is one that develops over time as you grow and evolve with your style, but putting aside an afternoon to experiment initially is a great way to find your feet and make some progress. Day 12: Have a blog post writing day. Just you, your laptop, and your content plan is where the magic usually happens. Let yourself take a break between each piece to let your mind regroup and recharge. And don't forget to make time to be your own copy editor! Day 13: Spend some time with your social media channels. Check in with your platforms, audit your profiles, and brainstorm some exciting ways you can bring some life back into your social presence. I shared 10 steps worth exploring this week here. Day 14: Check in with your #TakeYourContentToTheNextLevelBuddy and celebrate making it to this point. Cheer each other on as you make your way to day 15! Day 15: Set your content free for the world to see + build habits and systems to help you stay on track. Make regular time in your schedule for content planning sessions, blog post writing days, and 'big picture' time so you can stay in tune with your overall blogging values and goals. Have you enjoyed Take Your Content To The Next Level Week? Are you going to being taking on the 15 day challenge? TO CELEBRATE TAKE YOUR CONTENT TO THE NEXT LEVEL WEEK I HAVE A SPECIAL DISCOUNT ON MY CONTENT COACHING PACKAGE FOR BLOGGERS & CREATIVES. YOU CAN BOOK NOW AT JUST £63 BEFORE THE DISCOUNT ENDS THIS WEEKEND.